As part of the agricultural and applied economic priorities and solutions project, we are going to host webinars to encourage greater engagement in the ideas presented at the workshop. Please consider attending to hear more about these innovative and forward-thinking ideas! 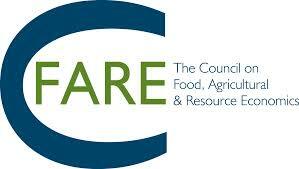 All webinars will be recorded and made available on the C-FARE YouTube Channel. This is a C-FARE facilitated event and part of AAEA Government Relations Activities. Keith Coble will discuss his vision for how our profession can contribute to solving important problems relating to agricultural production and policy questions associated with those problems. He will suggest that long-standing risks such as market volatility and weather and climate change will continue to pose new challenges while environmental and resource constraints will grow. However, the data used to answer important empirical questions appears be changing dramatically and big data is opening many new doors for research. Ultimately policy makers will still value quality scientific research from objective sources. The challenge is for our profession to provide it. Academic work in agricultural economics is increasingly driven by the availability of high-quality data sets. While this is good in that important policy questions can be answered more carefully, it does mean, however, that subject areas such as agribusiness and food supply chains that are not well endowed with data are not receiving the research attention they deserve. Graduate students must be shown the value of strong conceptual frameworks, case studies and structural econometric methods of empirical analysis to ensure that they are well equipped to effectively tackle a broad array of topics in their professional careers. The presentation will discuss emerging issues and priority areas related to food policy and consumer concerns about the the food. Sustainably growing the food needed to feed 9 billion people by mid-century in the face of climate change and growing policy interest in bioenergy is a grand societal challenge. Integrated approaches that link natural systems with human decisions and that improve our understanding of the effects of climate change on human and natural systems and the potential for adaptation are critical to finding innovative solutions. The potential to use big data to improve private and societal decision-making, the challenges of designing effective policies to address the multiple ecosystem services affected by agricultural systems and the importance of understanding the multi-dimensional spillover effects of agricultural, energy and environmental policies will be discussed.